Kasey and Michael were married earlier this summer in downtown Raleigh at The Stockroom at 230, which you may remember from their wedding sneak peek a couple weeks ago! Their wedding day was stunning, fun, and heartfelt, and we are so thankful and honored to have been a part of their big day. And now that their wedding images from the incredibly talented team at Blue Barn Photography have arrived, we can’t wait any longer to share them with you! Taylor from Blue Barn is truly phenomenal (and a dear friend! ), and she and her team outdid herself with these photographs. They completely capture the palpable joy, excitement, and love from Kasey and Michael’s wedding day! Kasey and Michael tied the knot on May 20th, and their entire wedding day was nothing less than spectacular! 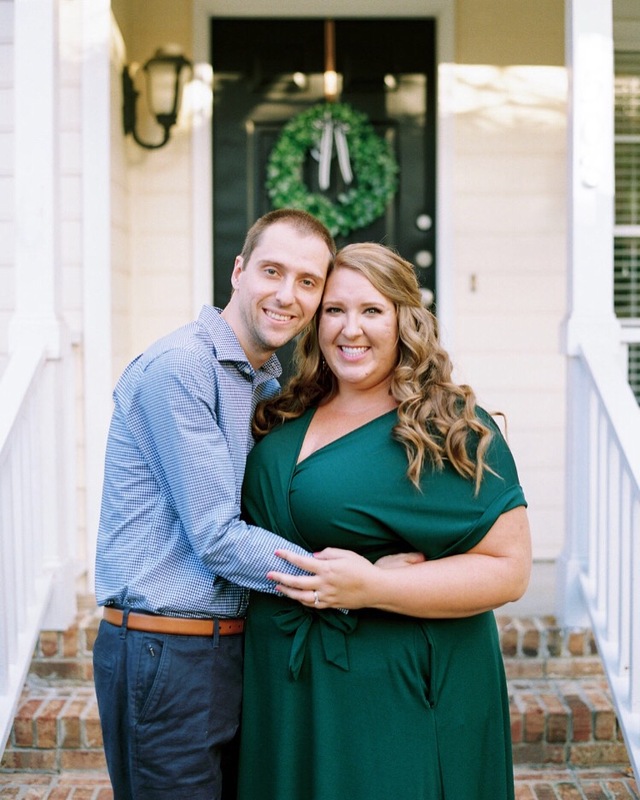 It was a beautiful (and very hot) day in downtown Raleigh, where their friends and family from New York City and all over came to celebrate their beautiful love. The ceremony and reception were held at The Stockroom at 230, which was the perfect urban venue for the occasion. Their special day consisted of mauve, blush, creams, navy, greenery, and perfectly thought-out details! Kasey did a fantastic job doing the so many of the calligraphy details herself, rofm the signs to the place cards. I love that she her own touch on the details, which made them so much more special and meaningful! There were plenty of lush peonies, market lights in the ceremony and reception spaces, rose gold details, and a fabulous chalkboard wall as a focal point. Kasey and Michael live in NYC and planned their entire wedding from afar, and I absolutely loved getting to know this couple. Kasey has such incredible style, which you can definitely see in her bridal attire and accessories, the gowns she chose for her beautiful bridesmaids, and so many of the meaningful and gorgeous details throughout their wedding. This sweet couple was an absolute pleasure to work with (I miss them already! ), and their wedding party was a dream as well. We absolutely loved being there for their day, and we hope you swoon over these photos as much as we are! A huge congrats to the newlyweds, Kasey and Michael! You guys are the very best! !